The D-backs have continually fought and clawed their way back from deficits all season long. It’s only fitting that it was a comeback victory that helped Arizona clinch the National League West crown. In front of an electric crowd of over 40,000 at Chase Field, the D-backs clinched the NL West title behind a 3-1 win on Friday night. A rally in the eighth inning propelled Arizona to its fifth division championship in franchise history and first since 2007. Both offenses were held scoreless through the first four innings. Then it was Giants shortstop Orlando Cabrera who broke the deadlock with a solo blast to left in the top of the fifth. Two innings later, Arizona first baseman Paul Goldschmidt walked to spark a rally in the bottom of the seventh. It was Chris Young’s turn next with one out and one on base. He drilled an RBI double to the wall in left-center to plate Goldschmidt and knot the score at 1-1. David Hernandez took over on the mound in the eighth inning and did what he’s done all season long: dominate. The right-hander froze Brett Pill on strike three for the third out and released an emotional fist pump as he walked toward the dugout. It turned out, the excitement had only begun. Ryan Roberts led of the bottom of the frame with a double before Aaron Hill’s sacrifice bunt advanced him to third. After the Giants elected to intentionally walk Justin Upton and Miguel Montero flied out, Goldschmidt stepped to the batter’s box again. Goldschmidt sent the Chase Field crowd into a frenzy by lining a two RBI triple into right field to inch the D-backs ahead, 3-1. As AC DC’s “Thunderstruck” began blaring from the ballpark’s sound system, indomitable closer J.J. Putz emerged from the bullpen to pitch the ninth. He faced a gauntlet of San Francisco pinch hitters. After Mark DeRosa started things off with a single, Putz struck out Pablo Sandoval and induced Orlando Cabrera to fly out. The decisive final out came when Aubrey Huff flew out to Young in center field to seal the division championship. 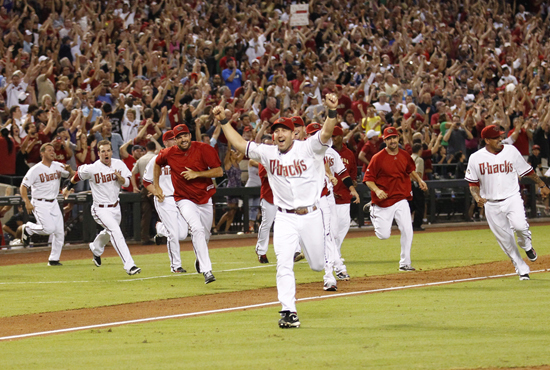 For tickets to the D-backs’ remaining regular season home schedule, CLICK HERE. For tickets to the D-backs’ Division Series match-up, CLICK HERE.